"The new public space isn't the static space anymore; it's something where events keep changing, programming keeps changing," he said. "I think there's a kind of realisation you need to keep changing for people to come back and intrigue them. "This idea of pop-up things happening and going away is really catching on." Say goodbye to expansive, landscape-dominating, big box shopping centres, Mr Rayner said. "They've been the bane of many architects over the years," he told ABC Radio Brisbane. Laneways and market-style streets are back in vogue and Brisbane's Fish Lane is a good example of this shift. The alley's exposed brick facades are adorned with edgy street art, tables packed with diners spill out onto the street, and small boutiques offer specialty products. It's a place where people spend as much time socialising as they do shopping. This was the sort of atmosphere larger retailers were trying to tap into, Mr Rayner said. "The developers are now thinking, 'What can we do with these malls to reorientate them'," he said. "It's all about experience; in other words, you might go there and see them as a town centre rather than as a shopping mall." This involves ditching walls and ceilings, switching off the air conditioning and introducing gardens and water features. Redesigning the lower levels of office buildings and corporate spaces to invite more people in, rather than keep them out, is also on the radar, according to Mr Rayner. "They'll start to put in activities that engage that workplace with the street and that might mean libraries, it might be fitness centres or childcare centres. "The kind of blurring of inside and outside that's been a symbol of Queensland houses over the years is now permeating into commercial architecture." Timber high-rises the new norm? Mr Rayner said another trend set to make an impression this year will be cross-laminated timber (CLT). Like plywood, sheets of lumber are layered to make panels that are light, flexible and strong. 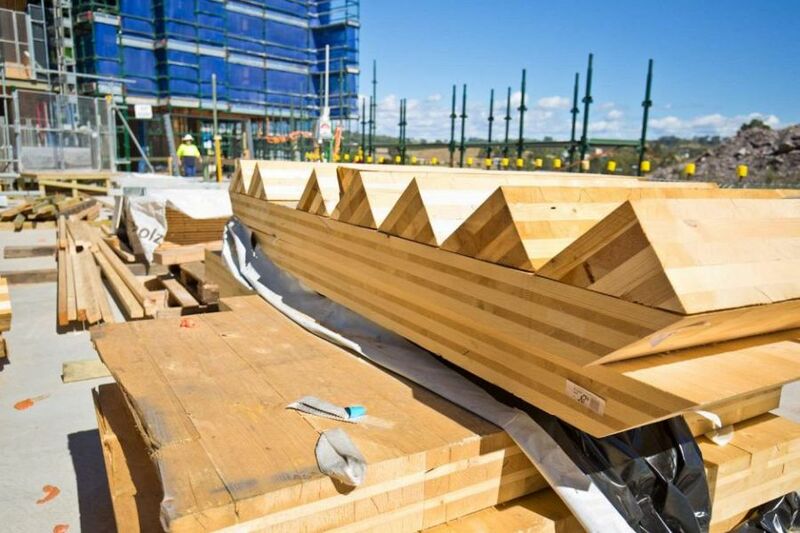 Research in Australia showed CLT panels could even be used to build high-rise buildings, Mr Rayner said. "It's caught lots of industries, I think the steel and concrete industry, by surprise. "We're doing a project on the Gold Coast at the moment that's got 12-metre-high timber vaults, multiple vaults, all done in this material. "I think it's the material of 2018." Charcoal and other shades of dark grey were go-to colours for developers last year. But Mr Rayner said it was not necessarily suitable for Queensland's sub-tropical climate. "It's just been a trend worldwide to do it; doesn't matter whether you're in a tropical city or a winter city," he said. "Dark grey is sort of that great levelling hue that everyone chooses and thinks you can offset some other things with it and it'll be beautiful. "It's not a great colour — it absorbs heat, it's not good for our climate and it fades over time." Mr Rayner defined modern Brisbane with projects like the Goodwill and Kurilpa bridges and redevelopment of some of the city's most iconic buildings including the Queensland Museum, QPAC and the Convention and Exhibition Centre. But he cautioned that the rampant redevelopment of suburban areas around the CBD in recent years was a concern. "We've got the old Queenslander areas here and a lot of the apartment buildings have made incursions into those areas, I think sometimes to the detriment of those spaces. "I think some of the planning has been lacking, particularly in providing public amenities." Brisbane's inner-city public schools were bursting at the seams last year as families with school-aged children flocked to smaller homes and apartments close to the CBD rather than settling in the outer suburbs. Mr Rayner said moves were being made to make sure new developments added to the appeal of the city rather than become an eyesore. Legislation controlling the size of developments would help, he said.